Sliders on each visualization panel (highlighted in green in the figure below) control the movement across respective axes. 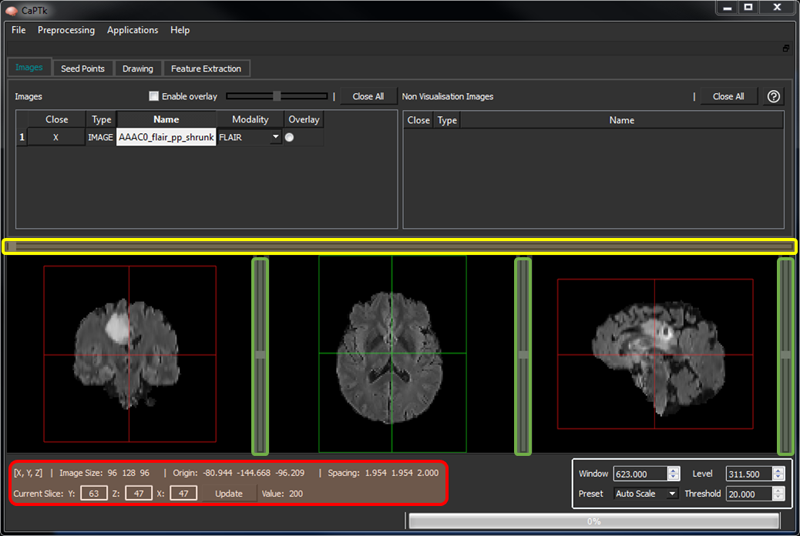 Note that in DSC-MRI, the single horizontal slider (highlighted in yellow) moves across the time of the acquired dynamic scan. contrast/brightness: right mouse button click + horizontal/vertical drag on any visualization panel, respectively. windowing of intensities and setting of different visualization type: bottom-right panel. zooming into the image via Ctrl + mouse wheel. The bottom-left panel of CaPTk (highlighted in red) shows basic information about the image and the position of the cross-hair. In the visualization panes, the "Z" axis is the center; and "Y" and "X" are to its left and right, respectively. "Z" represents the Axial view for RAI-to-LPS images. Double-click one of the two images you want to visualize and then click on its corresponding "overlay" radio button, on its right-most column. Click on the "overlay" radio button of the second image that you want to visualize. Both "Overlay" and "Underlay" images are now visualized with 50% opacity. Check the tick box "Change Opacity". Moving the slider changes the opacity between the "Overlay" and the "Underlay" images.